The Sisterhood of Salaam Shalom, a national organization that brings together Muslim and Jewish women, organized a unity vigil at the Jewish Theological Seminary in New York as part of the organization’s response to President Donald Trump’s travel ban. 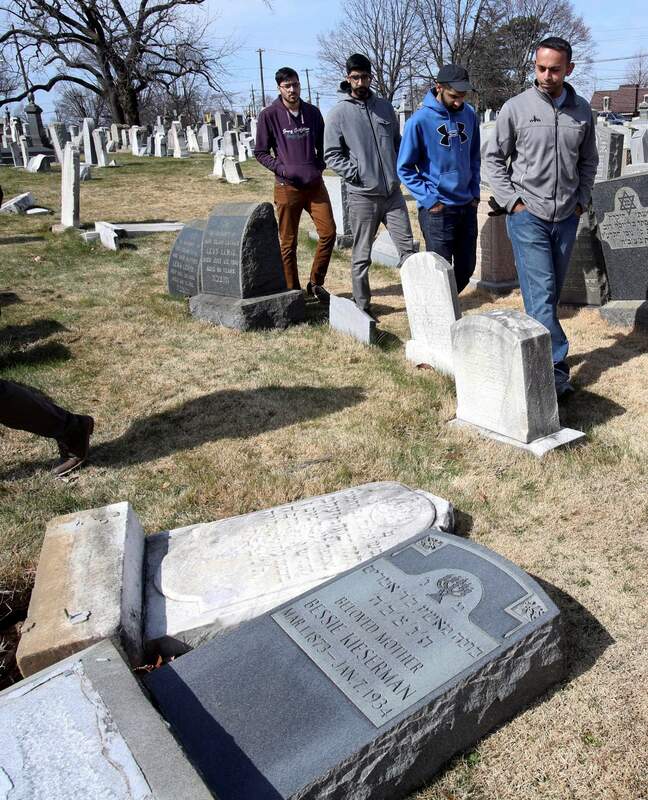 Volunteers from the Ahmadiyya Muslim Community survey damaged headstones at Mount Carmel Cemetery in Philadelphia. More than 100 headstones were vandalized at the Jewish cemetery. NEW YORK – They sat on either end of the congressmen’s couch, one a Jewish health care executive whose parents fled Germany in 1936, the other the Kashmiri Muslim chairman of a well-known American furniture chain. The men, Stanley Bergman and Farooq Kathwari, came to draw attention to an outbreak of hate crimes. But Bergman and Kathwari hoped their joint appearance would also send a broader message: that U.S. Jews and Muslims could put aside differences and work together. The men lead the Muslim-Jewish Advisory Council, created last year by the American Jewish Committee and the Islamic Society of North America, amid a flowering of alliances between members of the two faiths. U.S. Muslim and Jewish groups have been trying for years to make common cause with mixed success, often derailed by deep divisions over Israel and the Palestinians. But bigoted rhetoric and harassment targeting both religions since the presidential election has drawn people together. Jews have donated to repair mosques that were defaced or burned. Muslims raised money to repair vandalized Jewish cemeteries. Rabbis and imams marched together against President Donald Trump’s travel ban targeting majority Muslim countries. “I would never have thought I would see some people in conversation, or anywhere near each other. Then I saw people on Facebook standing next to each other at protests – Muslims and Jews,” said Aziza Hasan, executive director of NewGround: A Muslim-Jewish Partnership for Change in Los Angeles, which has run community relationship-building programs for more than a decade. Yet, despite this surge of goodwill, questions remain about whether these new connections can endure. The sense of vulnerability Muslims and Jews share, and their need for allies at a difficult time, have not erased tensions that in the past have kept them apart. Since Trump’s election, members of both faiths seem more willing to set aside differences as they work on civil rights and other issues, said Abdullah Antepli, who was the first Muslim chaplain at Duke University and is co-director of the Shalom Hartman Institute’s Muslim Leadership Initiative. It’s impossible to know definitively whether harassment based on religion has increased. The FBI’s most recent data on hate crimes is from 2015. Still, the last year or so has seen some dramatic examples of bigotry, including the waves of phoned-in bomb threats to Jewish Community Centers around the country. Mosques in Florida and Texas were recently set on fire, and authorities were investigating whether the suspected arsons could be considered hate crimes. When New York Arab-American activist Linda Sarsour recently helped raise more than $150,000 for the damaged Jewish cemeteries, some Jews debated whether it would be ethical to accept the donation. But in a sign of changing attitudes, several mainstream Jewish leaders who had worked with her previously defended her. 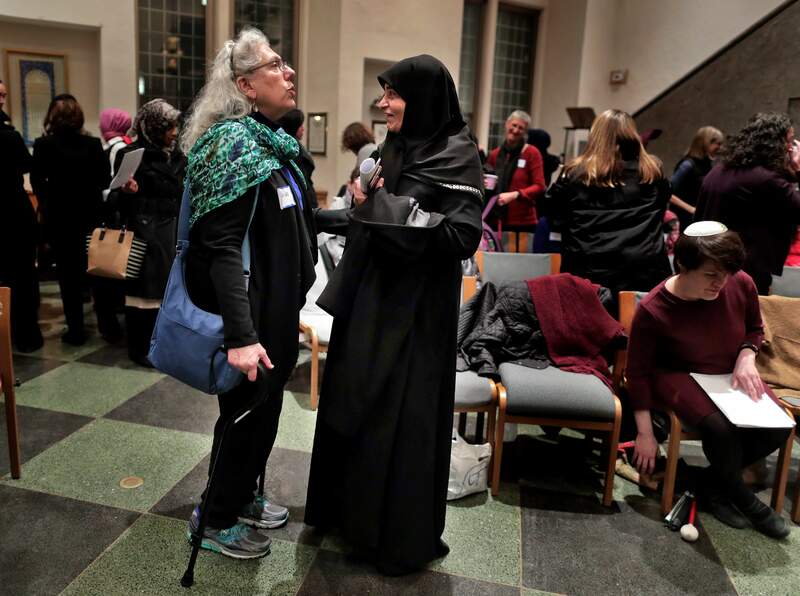 This new dynamic was evident at a recent New York vigil organized by the Sisterhood of Salaam Shalom, a national organization that brings together Muslim and Jewish women. The gathering at the Jewish Theological Seminary was part of the organization’s response to Trump’s travel ban. At their vigil, they walked to the front of the room in pairs – a Muslim and a Jew – to offer readings and prayers in Arabic and Hebrew. After the ceremony, the women hugged and posed together for selfies.